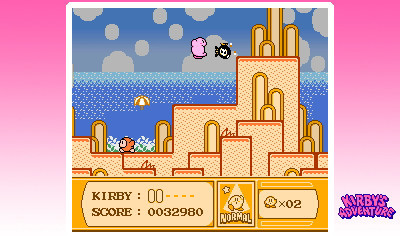 A 3D remake of the NES game Kirby's Adventure, developed by Arika for the Nintendo 3DS. When the people of Dream Land stop dreaming, Kirby finds King Dedede bathing in the Fountain of Dreams. The greedy king broke apart the Star Rod that powers the fountain and gave the pieces to his friends. Kirby sets out to gather the pieces and restore the Star Rod. The game retains all of the features of the original game, and throws in some 3D graphical tricks to background and foreground objects.